This interview was first published in PLOT v. 5 (Spring 2016), the journal of the Graduate Landscape Architecture Program at the Spitzer School of Architecture, CCNY. For over forty years, Patricia Johanson’s multidisciplinary designs have combined art, ecology, landscaping, and functional infrastructure. During the 1960s Johanson worked for Joseph Cornell and Georgia O’Keeffe, exhibited “minimal” paintings and sculpture, and designed one hundred and fifty gardens for House & Garden magazine. 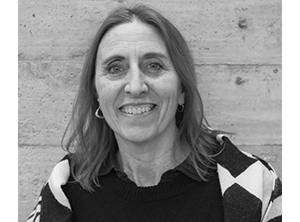 In the early 1970s she developed site designs for Mitchell / Giurgola Architects for buildings at Yale University, Columbus, Indiana, and Con Edison’s Indian Point Nuclear Generating Facility in Peekskill, New York. Recent work in Dallas, Texas; Petaluma, California; Salt Lake City, Utah; and Scranton, Pennsylvania incorporates municipal flood basins and water-treatment systems into public parks and restored wildlife habitat. 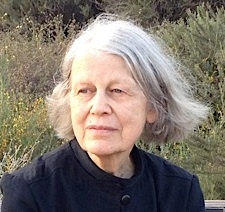 A graduate of Bennington College (Bachelor of Arts, 1962) and Hunter College (Master of Arts, 1964), Johanson also received a Bachelor of Architecture degree from the City College of New York in 1977. 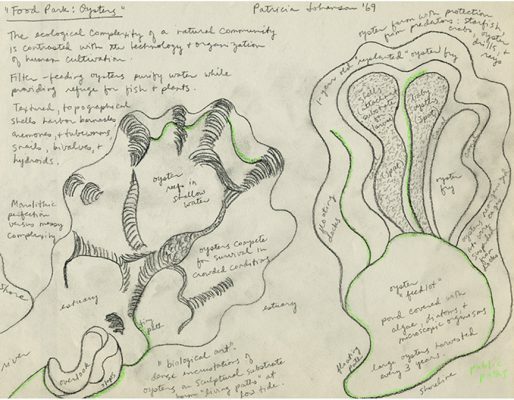 Michael Madden, a Landscape Architecture graduate student at City College, conducted this interview with Johanson in March 2016. How did you learn about ecological processes, and how did these influence your work? Observation. As a child growing up on the city streets I studied “urban nature”— especially what lived and grew in the cracks of sidewalks and vacant lots. These are amazingly complex ecosystems, as are the worlds of pigeons, cockroaches, and rats. I still enjoy seeing rats late at night, scurrying around on little squares of earth surrounding upper West Side trees, despite all our efforts to eradicate them. We inhabit a world that consists of more than just human needs and desires. I don’t believe in “perfect designs,” and have always been interested in the interstitial, marginal, and leftover spaces that exist in real-world constructs. That is why working with nature (even the parts we don’t like), giving it some autonomy, and harnessing its processes makes so much sense—but this requires a change of attitude and some design flexibility! What were the drivers behind your urban and infrastructural works at a time when many of your contemporaries were producing work in Utah’s tabula rasa terrain? I guess my initial fascination with water and infrastructure began as a small child, standing in the gutter and watching rainwater racing over my shoes on its way to the grated drains after a big storm. I’d change the angle of my feet to produce different obstructions, turbulence patterns and waterfalls, and watch leaves and garbage form impassable dams, forcing the water out into the street. My father, who was an engineer, answered questions and was a model of practicality. I always thought there needed to be a reason for building something, even if it was “only art,” and at the time, I felt the Earthworks artists were merely bolstering their reputations and enhancing sales by gouging the desert and publishing photographs in Artforum. I remained a “problem solver,” studying a range of environmental issues, many centered on infrastructure, and making sketches for projects that nobody would have built at that time. Implicit in your work is a social and ecological consciousness that is very relevant to the fields of design and landscape architecture. How did this develop over time to the large-scale imaginings of works like “Renal City”? I grew up in Olmsted’s parks, where a democratic cross-section of the population met on picnic grounds, playing fields, and rowing ponds. Later it was quite a shock to discover that these parks were not “natural scenery,” although birds, squirrels, aquatic life, and numerous migratory species proved that wildlife habitat could be quite vibrant within an urban setting. 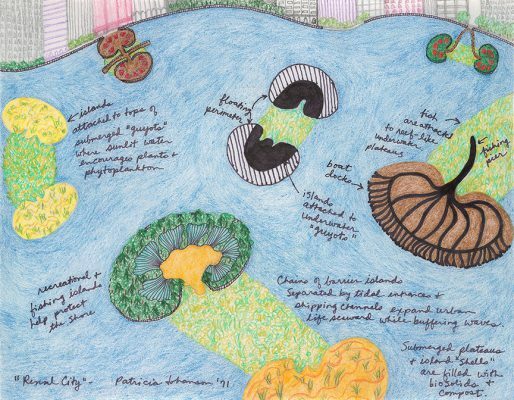 The project that had the biggest impact on my thinking was Olmsted’s Back Bay Fens and Riverway in Boston, structured around a complex solution to the problems of sewage and flooding that creatively connected a tidal area with two rivers and a brook. It seemed miraculous to be able to solve major engineering problems by creating a public park—especially when the underlying infrastructure was based on natural processes—and that is what I have been trying to do ever since. 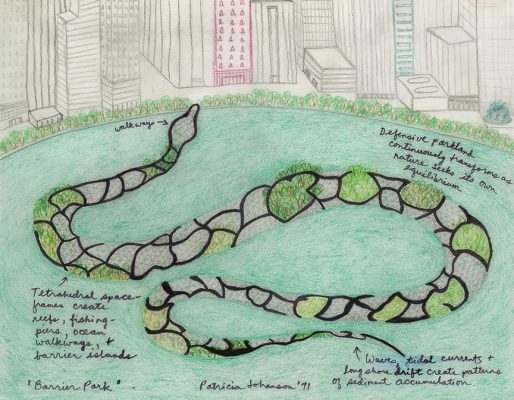 Both “Renal City” and “Barrier Park” (1971) combine aesthetic, social, and ecological benefits— reefs, fishing piers, and offshore islands—in structures that were designed to simultaneously create marine habitat, attract fish, and provide shoreline defense, while extending recreational opportunities and social meeting grounds. As a land artist operating at a range of scales, how do urban forms influence your design process? As a competitive artist in New York City during the 1960s and 1970s, I was certainly conversant with the urban design dialogue, but I always used this knowledge either for my own ends, or as something to react against. The structure for “Barrier Park”— on which sediment and vegetation accumulate from patterns of water movement and wind-blown seeds—is clearly a Bucky Fuller tetrahedral space-frame, one of the iconic urban forms of the 1960s. I would have been attracted by its low cost and ease of construction—but here the space frame is deployed to gather the world in, and would have been buried by natural processes, creating a defensive shoreline park. In general, I think most designers spend too much time worrying about forms, and not enough time trying to understanding how their projects function within the larger context, while also considering the ethical subtext of their work. Are your curvilinear and biomorphic forms a response to the orthogonal, the organic, or the ecological? My forms are very much like biological organs, in that they are designed to accomplish specific goals. They grow organically as solutions to design problems, with images added at the end, after all the basic engineering and environmental design has been completed. (My images are only meant to help people visualize the processes.) At the Ellis Creek Water Recycling Facility in Petaluma, California, where sewage is filtered through a range of wetlands, the forms define the treatment train as water flows by gravity from cell to cell, and is ultimately collected at a single point (the “nose” of a “mouse”) and pumped to UV disinfection and recycled water reservoirs (at the “tail” of the “mouse”). The twisted “roots” of a plant at Fair Park Lagoon in Dallas may look like Art Nouveau, but they are actually deployed to create microhabitats and prevent shoreline erosion, so what appears to be sculptural is actually functional. 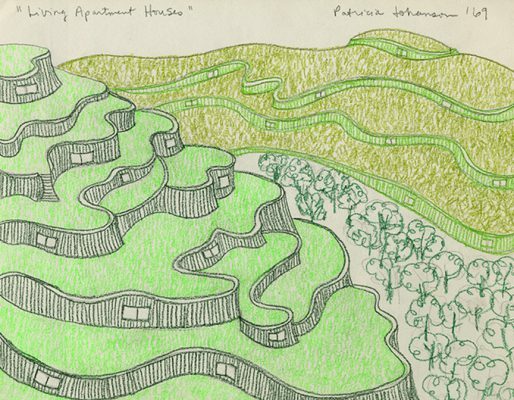 How did your background in architecture help you as a public environmental artist? It was essential, especially since I was working as a site planner for Mitchell / Giurgola Architects at the same time I was studying at City College of New York. So I was presenting my vision of the world to Charles Luce at Con Edison, Kingman Brewster at Yale, and J. Irwin Miller in Columbus, Indiana while absorbing information about public housing and “star” architects. I was a miserable failure in design classes, but learned a great deal about building technology and professional practice—enough to function on design teams. My heroine was Jane Jacobs—not a popular choice among architects in the 1970s, but required reading for public design. And I always stuck to my vision. My case study for an apartment house was Pueblo Bonito in Chaco Canyon. With the waning of the coal and oil industries, do you foresee “remediation by design” potential in more decommissioned sites, like that of “Mary’s Garden” in Scranton, Pennsylvania? These projects usually emanate from concerns over health and safety— protecting the watershed from soil erosion and acid mine drainage and remediating hazardous sites such as culm dumps (mountains of waste rock) and access to underground shafts and chambers. They are typically done by state agencies that use various chemical and biological methods to treat and filter the water, and they usually compact the earth, plant a monoculture, and build oversized channels filled with rip-rap to conduct water off the land as quickly as possible. 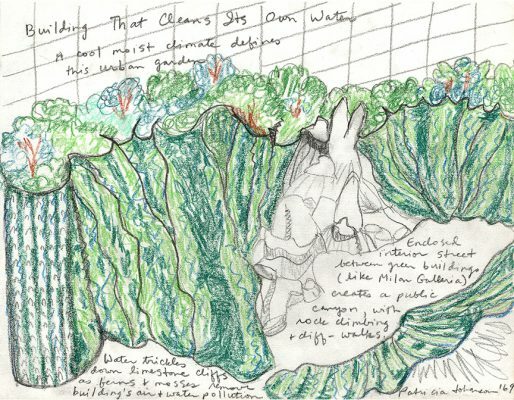 “Mary’s Garden” presents an alternate vision, retaining the monumental landforms and other traces of mining history while purifying water with wetlands plants, restoring a disrupted creek, and extracting energy from a geothermal resource— the “mine pool”— a vast underground lake created as surface water drops through caverns and voids on this porous site. Yes, there is plenty of design potential on mined land, but everything depends on the client and one’s vision of future use.